(1959) Douglas Kennedy, Marguerite Chapman, James Griffith. One of our best selling 50's sci-fi B classics. 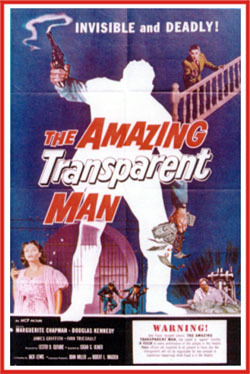 Terrific fun as an escaped bank robber is subjected to an atomic ray machine that renders him invisible. He breaks into military installations and banks, stealing radioactive materials and money. The film's climax features a struggle between Griffith and Kennedy in a lab where an atomic explosion is about to occur. Griffith screams in terror while Kennedy laughs hysterically and pins him to the floor preventing his escape. Vaporization is only seconds away. Priceless. Great special effects, too. 16mm.